I am a Research Associate I in Dr. Lirman's benthic ecology laboratory. Currently, I study the complex interactions between marine habitat restoration and coastal resilience, with a focus on how coral reefs can mitigate wave energy and storm surge, and how to optimize coral restoration efforts for the purposes of shoreline protection. As part of my research, I collaborate with UM's SUSTAIN lab, to examine the effects of staghorn models on wave dynamics in the SUSTAIN hurricane simulator tank. This work is funded by UM's own ULINK program for interdisciplinary research. I also assist with restoration fieldwork, outreach, and the Rescue a Reef program. I completed my Master's of Professional Science (MPS) degree in this lab in 2017 with my thesis "Supporting Coastal Resilience through Restoration of Coral Reefs" and was brought back in by Dr. Lirman as a researcher in 2018. Prior to my time at UM RSMAS, I was working in the medical field after graduating with my B.A. in Biology at the University of Virginia in 2012. 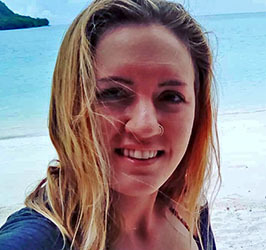 I have also worked as a PADI scuba instructor, field researcher for the Seahorse Project, and marine conservation outreach agent in the Solomon Islands for the Dolphin Project. It has been a lifelong passion of mine to contribute to marine conservation science, and I am fortunate to be able to work with such an excellent team in and out of the field.